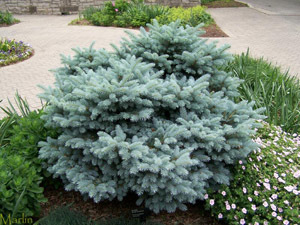 The great short blue needles of the Globe Blue Spruce make this compact evergreen shrub a real eye pleaser. It is an evergreen shrub that you can plant under your window sills so you can keep that beautiful view out your window. It is a slow grower and adapts well to most soils. The Globe Blue Spruce does not have any fruit and produces no flowers. But, it is so easy to maintain and take care of, you will fall in love with it like we did. We have it out in full sun and the landscapers say to keep it in full sun. It grows so slow you may never have to trim it. It is supposed to max out at a height of 3 feet and can expand to a spread of 3 to 4 feet.